Is Uncertainty Back In The Mix So Soon? | Marketfy or install Google Chrome Frame to experience this site. Marketfy > State of the Markets > Is Uncertainty Back In The Mix So Soon? Is Uncertainty Back In The Mix So Soon? While it may sound strange, perhaps the best word to describe the market action on Monday is, disappointing. Yes, the Dow Jones Industrial Average popped 288 points. The S&P 500 gained 1.1%. The NASDAQ 100 surged 1.5%. And oil jumped 5%. Yet, based on the early indications from the futures and some of the developments of the day, the end result left something to be desired. With the two big, bad fears that had been the primary drivers of the recent correction - fears that the Fed would overshoot and the trade war with China would become a drag on the global economy - appearing to be resolved, investors came into Monday morning in a good mood. Stock futures had been pointing to a gain for the Dow of more than 450 points. And based on the way the trend-following algos tend to "chase their tails" on days when the indices experience outsized moves, one might have expected the early gains to build as the day wore on. But instead of traders falling all over themselves to cover their shorts, add some exposure, and put risk back on, we got the opposite. Exactly one minute after the stock market's opening bell rang, the sellers attacked. And by 11:47 am EST, the venerable DJIA had given back 306 points of the day's gain. Heck, at one point, both the Russell 200 and S&P Midcap indices were red on the day. The word you are probably looking for is, ugh. So, what gives here? Why was good news not viewed as such? Why weren't the sellers overrun with buy orders? After all, Powell had talked nice and Trump had made a "deal" with China. And since the outlook for the U.S. economy, and, in turn, corporate earnings, both should improve given these developments, why weren't stocks "melting up?" The answer, in short, appears to be, uncertainty. It turns out that official reports from the White House and China didn't exactly jive with the Trump tweets declaring that a great deal had been struck. China also wouldn't confirm the report that they were going to back off on auto tariffs. As such, some doubt began to creep in on the prospects for a trade deal to actually get done. Now mix in word that Trump had decided that it wouldn't be Secretary of State Steven Mnuchin leading the trade talks with China (the U.S. representative China favored), but instead, noted trade hardliner, Robert Lighthizer. Suddenly, one couldn't be blamed for moving from uncertainty to doubt over the potential for the trade deal to be completed within the 90-day window. Oh, and while the trading narrative was that the economy would likely improve and inflation would perk up with the Fed and trade issues out of the way, the yield on the 10-year began to dive just after the open. The yield on the 10-Year Note finished the day below 3% at 2.992%. And for those of you keeping score at home, part of the yield curve (the 2-5 year) began to invert yesterday. Of course, it didn't take long for the bears to jump on the development in the bond market and start to yammer on about the expectations for an economic slowdown. But The Correction is Over, Right? With all the weekend news surrounding the trade "deal" (a term that is now being used with some trepidation) stock market investors couldn't be blamed for thinking that the corrective phase was officially over. Along these lines, it was time to start thinking about putting risk back on and where the best opportunities were going to be in 2019. To which, I'd like to say, not so fast. You see, a chart produced by the good folks at Ned Davis Research Group caught my eye the other day that really sums up the current situation. In the chart below, NDR has created composites for the S&P 500 after 10% corrections. 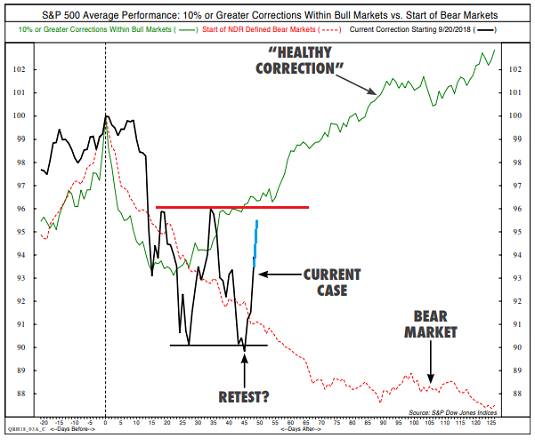 The green line represents what has happened to the S&P when a 10% correction turned out to be "healthy corrections," the red dashed line shows what happened when a bear market ensued, and the black line is the current case. Note that I've augmented the current case to reflect Monday's move (represented by the teal extension). So... My take on this chart is the jury is still out on the question of whether or not the correction has ended. I'll say it again, ugh." While I do not proclaim to be an expert in chart analysis, it looks to me that in order for the bulls to be convinced that the recent ugly action in stocks was merely a "healthy correction," the S&P 500 needs to make - at the very least - a "higher high" on a closing basis. My take is the index needs to push through 2813.89 in a meaningful way for the bulls to feel good about a year-end rally continuing. We should also keep in mind that Jerome Powell is set to testify in front of Congress soon. And that the FOMC will meet on December 18-19. So, with uncertainty back in the mix on the trade "deal," some concern about what Powell will say to Congress, and the fact that the Fed is very likely to hike rates again in a couple weeks, traders appear to be dialing back their expectations for a "melt up" move from here.